On his return trip from the moon on the Apollo 14 mission, astronaut Edgar Mitchell stared out of the window at our blue planet Earth. At that moment something profound hit him. All of a sudden he was hurtled out of his normal consciousness and felt an intense oneness, a connectedness with planet Earth and in fact all of the universe. Never before had he had such an experience. His ego and the separate world outside of him merged. He could no longer discern a difference; he himself had become the universe! His thoughts seemed to have an effect on the outer world and the outer world seemed to have an effect on his thoughts. He was fully aware of the fact that the separation of his ego and the universe at large does not exist. It is the experience described in quantum scientific terms by David Bohm wherein the observer becomes the observed! Many people in all walks of life throughout the ages have reported such experiences; it is called a mystical experience. In a flash of higher consciousness a higher truth is revealed that dramatically changes the life of the person who underwent the experience. And such was the case with Edgar Mitchell. After his safe return to Earth, he founded in 1973 a non-profit organization the ‘Institute of Noetic Sciences’ aimed at studying the nature of human consciousness. After Descartes had called for a divorce between science and religion, consciousness and science were never close friends. Science simply ignored the relevance of consciousness. Science is supposed to be an objective study of nature and holds no interest in the subjective conscious experience of individual humans. To science, these are just two separate things. Anyway how is science to study nature if our personal experience plays a significant role in it? ...that were reported by so many people time and again, were simply dismissed into the realms of myths and parables. Now from a scientific point of view where science is supposed to study every aspect of our existence, that is a very unscientific approach! The sceptical attitude adopted by science has created a taboo in our western society that still prevails today. People who underwent these experiences often feel misunderstood and are not taken seriously. Many scientists even today are afraid to even consider examining these phenomena, afraid of jeopardizing their careers since some who have tried were cast out of the scientific community. Fortunately quantum science has forced scientists to change their minds about the subject and a more positive attitude has emerged in the last two decades. A scientific taboo seems finally broken and thanks to people like Edgar Mitchell, consciousness has become a serious subject for scientific scrutiny after all. In this chapter we will provide some very interesting scientific insights in the enigma of human consciousness. Maybe the most difficult question raised in science ever is called the ‘hard problem’ or the ‘binding problem’. It is the problem of how the immaterial world of our thoughts and feelings interfaces with the material world of our body. Emotional states caused by our thoughts and feelings (immaterial world) are immediately reflected in the physiology of our body (material world). For instance, when an immaterial thought pops up in your brain to raise your hand, immediately your brain starts to produce neurotransmitter messengers that are carried along the nervous system. Electrical impulses are sent to the muscles in your hand that will finally respond to your initial thought. Now how is this possible? How can something immaterial as a thought have a real noticeable physical effect? It happens all the time in your body! Since Descartes decided that there is a split between body and mind we are not likely to get answers from Newtonian physics. Then how can the bridge between the immaterial world of the mind and the material world of the body be crossed? Maybe we can get some answers from quantum physics? All of our outer reality that is perceived by the brain comes from the five senses, hearing, smell, taste, touch and visual perception. According to philosopher Immanuel Kant (1724-1804) we should make a distinction between the noumenal world, the world in itself (daß Ding an sich) and the phenomenal world, the world as we perceive it. What Kant meant is that it is impossible to directly perceive the world; we can only perceive it through our senses. What outer reality really is nobody knows, because we can never directly perceive it. The question may even be raised if there is a physical reality at all? However Kant believed that physical reality, the source of our perceptions is real. Immanuel Kant stated that what we know of the world at large is an interpretation made by our brain. Don’t tell me you failed! Of course you did because there are no black dots in the picture! 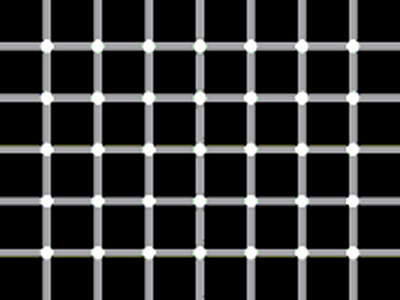 Your brain imagined the black dots that you saw jumping back and forth! The translation your brain makes from the external stimulus of the visual cortex to the picture that you hold in your head is all from external electromagnetic wave patterns. You may never have thought about it this way, but the color red does not exist! The color red like the black dots in the picture above is only a translation, a representation that makes sense to you. The color red is a subjective construction of what is no more than an electromagnetic wave with a distinct frequency, amplitude and phase. since they cannot see it, they will perceive it as black. You don’t even known how your fellow humans perceive the color red! This is what Immanuel Kant meant when he said that we cannot possibly see the noumenal world, the world in itself, we only see our personal version, our interpretation of a reality that is out there. By default it is restricted since we only interpret a few percentages of the whole spectrum of electromagnetic energy that exists. We learned in school that our brain is a kind of super computer with loads of neurons firing at the synapses, processing the vibratory information received from the five senses. Our thoughts are personal and supposedly no one has access to them but us! Our memories are engraved into grey cells that constitute the brain. That’s what the majority of people were taught in school and still believes today. Science has progressed quite a bit from the time of the dusty old ragged schoolbooks and now uses quantum science to explain consciousness. In 1920 Wilder Penfield believed that memories were stored as engrams at a specific location or address in the brain, just as a computer stores its data in a specific memory location. Karl Lashley on the hunt for these engrams eventually found by experimenting on rats that memories are not stored at dedicated locations inside the brain at all. Memories seemed to be dispersed all over the brain and each part of the brain seemed to contain the whole memory. Since memory storage is distributed all over the brain and each part contains the whole memory, it may explain why people with dysfunctional areas in the brain still hold on to their memories. The ‘part contains the whole’ aspect of the brain’s memories triggered Stanford neurophysiologist Karl Pribram when he learned about holography in 1960. He came up with a new explanation for memory storage and believed that the brain stores memories as a wave interference pattern like a hologram. A hologram is three-dimensional picture that is stored on a two dimensional photo as a wave pattern. It is constructed by splitting a coherent laser beam into two beams using mirrors. These two beams are recorded as a wave interference pattern on a photosensitive plate where the subject being photographed diffuses one of the beams and the other the reference beam, is aimed straight at the photosensitive plate. When viewed in normal daylight the hologram doesn’t make sense, it contains a lot of blurry circles! However when a laser beam is shone through the hologram, a three dimensional picture of the original subject emerges that can be viewed from multiple angles. The three dimensional picture seems to be floating in the air. Now the brain’s memories are thought to be stored in the same manner as the hologram stores a picture. Holographic memory storage can also explain the huge storage capacity of the brain of the order of 10 billion bits of information in an average human lifetime. Holograms are also very good at explaining how the brain manages to access and remember things very fast from its huge repository of information. In a blink of an eye we recognize a face of someone we haven't seen for many years even if the facial expression of the person has aged. Holographic images can easily be compared and matched even when they are not a 100% identical. Pribram showed that not only our memories but all our cognitive processes, smell, taste, hearing and seeing may be explained by holographic principles. Let’s take visual perception as an example. The current view of science is that the picture of the world is projected through the lens of the eye onto a canvas, the retina in the back of the skull, and that this picture is somehow 'digitized' by the brain and its pixels stored. Pribram proved that dedicated nerve cells in the eye respond to certain frequencies of electromagnetic waves that hit the eye. The picture is viewed as a set of frequencies and not as individual dots or pixels. Now how can a picture contain frequencies you may ask? Well in a process called Fourier transformation, spatial information can be translated into a frequency spectrum. Jean Fourier proved that any kind of waveform could be constructed from pure sine waves. When multiple sine waves of different frequencies, phase and amplitudes are superimposed, any kind of waveform can be constructed. The process of determining the constituents of the wave is called spectrum analysis and is mathematically described by the inverse Fourier transformation. The inverse Fourier transformation is used to create the original wave from the spectrum of sine waves. Now Fourier transformations can also be applied to two-dimensional spatial information. What Pribram found was that the cortex of the brain conducts a Fourier transformation on the visual image in the eye and distributes the constituent frequencies of the picture all over the neurons in the brain. So the picture is actually internalized and memorized as a wave interference pattern among neurons, just like the hologram stores the picture. The original memory of the picture can be reconstructed from the holographic representation by the inverse Fourier transformation creating a visual image inside our head. The construction of an image from a spectrum of individual sine wave frequencies is the technique used in the MRI (Magnetic Resonance Imaging) scanner used in hospitals. The MRI scanner also uses Fourier transformations to construct a holographic image of the scanned body from the excited hydrogen atoms in the water molecules in the body. This MRI technique has been developed by Walter Schempp who later contributed to the quantum brain theory stating that memories are not actually stored within the brain itself but in the fabric of space, the physical vacuum. The brain acts simply as a reader/writer tool to access the physical vacuum where the holographic memory is stored as a wave pattern. When we combine Karl Pribram's holographic theory of the brain with David Bohm's theory that our universe as a whole is just a giant hologram, we get an interesting view of reality, called the holographic paradigm. In the holographic paradigm, the universe is seen as just a huge repository of electromagnetic frequencies encoding multiple levels of reality. The brain, using Fourier analyses, decodes one channel out of a blur of electromagnetic frequencies in the universe and from this constructs our inner representation of reality. Our brain is limited to receiving only a limited range of frequencies from the outside world and hence receives a limited scope of reality. We could say that the brain tunes into one reality much like a radio only tunes into one station. We think we move through a solid world of images that are perceived by the brain but the fundamental truth could be that we simply decode just one reality out of many parallel worlds. The holographic paradigm solves many mysteries involving paranormal phenomena since individual brains are just a part of the whole, the universal brain. All brains in the holographic paradigm are infinitely connected and paranormal information (telepathy) can easily flow from one brain to another. Stuart Hameroff and Roger Penrose contributed to the quantum brain theory by presenting a model of the brain based on quantum computing. They believe that our brain processes information from the neurons not only in classical states but may be using quantum states as well. Quantum states within the brain were long believed to be absolutely impossible since the brain was too big, too wet and too hot to sustain quantum states that were hitherto only observed in the laboratory in isolated and controlled situations at the subatomic scale. However Hameroff now believes he has found the building block, the qubit for quantum computing in the brain. He identified a tiny tube called a microtubule that comprises the cytoskeleton of the cell. The cytoskeleton is the skeleton that gives the cell its structure; it’s the scaffolding of the cell. Besides giving structure to the cell, the microtubule is also a transportation pipe for all sorts of chemical compounds used by the cell. Hameroff points out that the cytoskeleton may also have a neural function and that they may even be more advanced than neurons themselves. The neural function of the cytoskeleton may explain why a single cell organism can perform intelligent tasks. Although the single cell organism does not have a neural network, no neurons and no brain, it has some primitive form of consciousness since it can perform intelligent tasks such as swimming, eating and mating! Now for humans, we have a brain consisting of neurons that are interconnected by dendrites and synapses that make up the central nervous system. Inside the neuron cell we find a cytoskeleton built form microtubules. The microtubule itself is constructed from tubulins, hexagonal structured proteins. It is the tubulin within the microtubule of the neuron that Hameroff has identified as the qubit of the brain. The classical interpretation of neurobiology has been that concentrations of various ions carry impulses to and from the central nervous system and are responsible for all the information processed by the nervous system as a whole. Hameroff however noticed that the microtubule contains highly coherent light (laser like light) and that this light might play an important role in the information processing by the brain. Fritz Popp had already discovered the emission of bio photons by the human body. Popp found that weak emissions of bio photons could be detected emerging from not only the human body but from all biological life forms and suspected that the source of these bio photon emissions is related to DNA. Hameroff found coherent bio photons inside the microtubule in their quantum state. In other words the bio photons were coherent and quantum entangled. The microtubule is filled with water molecules that are highly coherently ordered, and Hameroff believes that this ordered water plays a significant role in the conductance of the bio photons through the microtubule. When the bio photons pass through the microtubule they are sent to the synapses of the neuron and then move over to the next neuron. In this way the microtubules acts as a wiring system for the coherent light in the brain and in fact all of the rest of the body. This network of microtubules is referred to as the Internet of the human body connecting not only the nerve cells but also every other cell in the body. It allows for quantum information exchange between the brain and the rest of the body. The implication is that consciousness is not restricted to the brain itself but that all cells of the body share in the same conscious awareness. This may explain the holistic nature of consciousness whereby our thoughts and feelings act in unity in the body. Think what happens when you’re infatuated and the person you are in love with suddenly jumps out in front of you. All of your body and brain will respond instantaneously and in unity! Your eyes get wider, your heart starts to pump faster, you breathe faster, your adrenalin level goes up and you feel butterflies in your belly while your knees start to shake, all of this in unison. The unified response of the body in a single moment is sent over the body’s neural Internet through the microtubule ‘wiring’ as a coherent wave of light connecting all the cells in the body. Hameroff’s companion, mathematician Roger Penrose developed a new alternative for the Copenhagen interpretation of quantum physics, the collapse of the quantum wave by conscious observation. Penrose proposes an objective reduction (reduction is a synonym for the ‘collapse of the quantum wave’). Objective reduction (OR) calls for the collapse of the quantum wave without human conscious observation but just happens when a ‘certain threshold’ of what he calls quantum gravity is reached. The quantum computation that goes around in the brain uses a feedback mechanism from the organism’s sensory input and that’s why the collapse of the quantum state maintained in the microtubule is called an Orchestrated Objective Reduction (Orch OR). The classical state of the sensory input, orchestrates, manages the quantum computation by means of the feedback loop. Now Hameroff’s quantum brain model makes a point of mentioning that consciousness, our thoughts and feelings are a result of the objective reduction (OR) of a superposition of all possible thoughts and feelings taking place in the qubits inside the microtubules inside the neurons of the brain. In other words our personal thoughts are just a collapse of universal thoughts. The quantum brain model states that the universe itself has fundamental proto consciousness properties! It is this proto consciousness, or universal consciousness (thoughts of all thoughts) that collapses into our individual consciousness in the qubits of the brain. This happens at an average rate of 40 collapses per second corresponding to the 40 Hz brainwave frequency. Our awareness of internal thoughts and feelings are constructed like the movie frames in a motion picture at the speed of 40 frames per second from a universal consciousness. Hameroff and Penrose point out that their Orchestrated Objective Reduction (Orch OR) model for quantum processing in the mind is consistent with the spiritual teachings of Buddhism, Hinduism and Kabbalah that all teach the existence of a universal mind. Now what we have here is a model of the brain that states that consciousness is not the epiphenomenon, the result of brain activity, but that the brain must be regarded as a big antenna or receiver of a universal consciousness that is everywhere in the universe! Now the quantum brain theory has many opponents and is still in its infancy, but it has already drawn a lot of attention and may one day be widely accepted as exactly the way the brain works. Dr. William Tiller is a professor emeritus of Stanford University and cofounder of the Institute of Noetic Sciences and the Academy of Parapsychology and Medicine. For the majority of his career he had been a professor in the department of ‘Materials Science and Engineering’ at Stanford University and his many subjects were metallurgy, crystal growths, semiconductor materials etc. However in the sixties he started out a whole new career in a subject that had always interested him, the study of the paranormal and unexplained areas of human consciousness. His research was aimed at bridging the gap between science and spirituality. Therefore he adopted strict scientific protocols in his research such that he could seriously attract the attention of other scholars. He became interested in studying subtle energies, energies such as Reiki energy used in human healing by spiritually inclined people that can currently not be explained by our scientific understanding. Dr. Tiller developed an ultra-sensitive kind of Geiger counter device to measure the subtle energies emitted by the hands of the Reiki masters and demonstrated the existence of an energy field that is not in the electromagnetic spectrum. This experiment was a positive stimulus for the Reiki community, they now had a scientific confirmation that the Reiki energy fields were real and that they could be measured. In his research, professor Tiller noticed that the healing intention sent to the hands by the Reiki practitioners had a crucial effect on the energy output measured. From these experiments he concluded that the human intentions via our thoughts and feelings have a measurable effect on physical reality. He also tested Qi Gong Masters and found that their hands had a healing magnetism equivalent of a 20,000 gauss magnet. Their palms emitted a beam of infrared radiation (1 to 4.5 microns in wavelength) that had healing benefits. The results measured were highly significant, the possibility of occurrence by chance were less than one in 1000. With these experiments William Tiller had proved once and for all that our human intentions have a real measurable effect on physical reality. After continuous testing for 3 to 4 months, he noticed that the intentioned effects of the experiment continued even when the IIED device was removed from the room. Somehow the room of the laboratory in which the experiments were conducted had become conditioned. The IIED device was no longer needed to have the same effect. William Tiller’s experiments may be an indirect indication that our prayers have a real effect and are answered. Tiller thinks that places where people gather with their positive intentions to pray for better times, may get permanently conditioned and become sacred places, after years and years being imprinted with the same intention. He explains the effect that he measured by stating that the state of the physical vacuum in the room where the experiment was conducted had somehow changed. In its normal state the physical vacuum of the room is energetic, chaotic and random. However by imposing our intentions the energetic order in the physical vacuum can be significantly and permanently changed. Japanese researcher Dr Masaru Emoto, chief of the Hado institute in Tokyo, demonstrates probably the most convincing and startling effects that human consciousness can have on physical reality. Dr Emoto has discovered an effect on water that was given the name the ‘Hado’ effect. ‘Hado is the intrinsic vibration pattern at the atomic level in all matter, the smallest unit of energy. Its basis is the energy of human consciousness’. He wrote a book that was issued in 1999 called ‘The Messages From Water’ that has sold millions of copies already around the globe and has been translated in many languages. He’s lecturing and holding seminars around the world and also conducts live experiments where he demonstrates the ‘Hado’ effect of water. The word ‘Hado’ is now a buzzword in Japan. People use it to express the vibrations of a place or person, ‘this place has no Hado’ or ‘He is low on Hado today’! And all this upheaval is about crystallized frozen water? What is it that he has discovered? Dr. Masaru Emoto has performed a series of experiments in which he proves that our thoughts and feelings affect our physical reality. Water was his subject of study and he started out studying the shape of water ice crystals. He used all sorts of water from all different places all over the world and studied how they would form ice crystals. He noticed that water from heavily polluted rivers doesn’t crystallize at all and that clean mineral spring water produces beautiful ice crystals when frozen. So far so good, it is a result that may be expected. However to his amazement he discovered that the crystallization of the water molecules was somehow related to his mood. He started experiments in which he used clean tap water and sent all kinds of human emotional thoughts and feelings to the water samples before freezing them. To his astonishment the water reacted to his intentions. When negative thoughts and feelings were used, no beautiful ice crystals were formed, they were either chaotic in form or did not crystallize at all. However when he sent loving thoughts and feelings to the water before freezing it, the most beautiful and regular highly organized crystals formed. In following experiments he put stickers on the bottles of water and labeled them with words like ‘Love, God’ and ‘Hate and Devil’ and again the ice crystals reflected the intention of the words put onto them. Next he experimented with all kinds of music to test the effect. Music is a natural expressing of vibrations and it was no longer a surprise that the vibrations of lovely classical music versus aggressive angry hard rock music were also reflected in the ice crystals. ‘since all phenomena are at heart resonating energy, by changing the vibration we can change the substance’. So when we want to change the internal vibration of let’s say polluted water, we can use our positive intention to clean this water! And that’s exactly what Dr. Emoto and his ‘followers’ are now doing. All over the world Hado cleansing rituals are held to clean our rivers, seas and oceans. The first time he demonstrated the effect of Hado in public, he gathered a crowd of 350 people around Japan’s most polluted lake, Lake Biwa on the 25th of July 1999. The foul water smelled horrendous caused by the algae ‘Kokanada’ that yearly covered the lake! In the gathering organized by Dr. Emoto a large crowd of people projected their positive intentions like a laser beam onto the polluted waters. Water samples of the lake’s water were taken before and after the ceremony and a dramatic improvement of the structure of the water crystals was detected. A month after the ceremony, a newspaper article appeared in the influential Kyoto Shinburn newspaper. ‘the spread of the water algae had improved and that the foul stench had disappeared’. Maharishi Mahesh Yogi teaches transcendental meditation (TM), a form of meditation that brings the spiritual seeker into higher states of consciousness. His present residence is situated in the woods of Vlodrop in the Netherlands. He has selected this place because according to the Maharishi, this place has positive vibrations. The followers of Maharishi count an increasing number of scientifically educated people. These people have come to realize that the meditations of the Maharishi have a positive effect on world peace. Science has driven them to compare notes with eastern spiritual teachings and given them a new conviction. Transcendental Meditation (TM) has become very popular all over the world especially since the Beatles visited the Maharishi in the sixties. Scores of business managers are using TM as a stress-relief therapy. Extensive research conducted on the effect of TM showed that when practiced by a large group of people they could substantially drop the crime rate in a large city. When the group discontinued their TM, the crime rate went up again to the average level. This effect has become known as the Maharishi effect and multiple studies have proven that this effect exists. Many people pray for their loved-ones when they are seriously ill. They hope that a divine force will hear and respect their request and cure the patient. Others pray by using their inner powers and believe that they can heal at a distance using their sheer intention to help the patient. Three medical researches at the University of Texas Health Science Center in San Antonio published their results of a scientific investigation about the role belief plays in prayer in the summer of 2004. A group of 86 people, were, without their prior knowledge of the double blind experiment, were assigned to either a prayer treatment or to a control group. The volunteers that prayed only knew the names and health concerns of the people that were assigned to them. Eight volunteers from a local prayer group prayed twice a day for a period of at least 3 minutes. After a month, the results were compiled for publication. If anyone in the last decades has had a major impact in the holistic medicine it must be Dr Deepak Chopra. Born and raised in India, he had his medical education in the Unites States. It was after a personal meeting with the Maharishi Mahesh Yogi that he was persuaded to study the 4000-year-old traditional Indian Ayurveda. Ayurveda is Sanskrit for the ‘the science of life’. After his meeting with the Maharishi he went to take the train where he met a friend who handed him a book about Ayurveda. One and one makes two and Deepak knew there was a message here. After reading the book, he became convinced that there was more to Ayurveda than commonly believed in the West. Dr Chopra had become frustrated in his medical career because he could do so little for his cancer patients. In his book ‘Quantum Healing, exploring the frontiers of mind/body medicine’, Doctor Chopra explains the relation between quantum physics and Ayurveda. Ayurveda teaches that all is spirit and that also the body is created by the mind. In this respect the mind must have all the power to heal the body. Notice that there is no ‘hard problem’ to be solved in Ayurveda, there simply is no bridge to cross between the immaterial and the material world since there is no duality in mind and body. According to Deepak Chopra our deepest thoughts and feelings play a significant role in the healing of a patient. This has been seriously underestimated in western medical practices. The body is constantly recycling every atom in every cell. In a year’s time the body is completely renewed and every atom in every cell has been replaced. Then what exactly is it that keeps that tumor in its place if the whole body is rebuilt every year? Deepak explains that the blueprint for the physical body is the subtler quantum body. Diseases appear in this quantum body before they manifest in the physical body. As long as the disease is not removed from the quantum body, the blueprint, the body will continuously reconstruct the body along with the tumor. According to Deepak the mind has the capability to produce every drug that Hoffman La Roche sells only at no expense, in the purest form and in the perfect dose. The ability of the mind to heal the body may explain the well know placebo effect, the effect whereby a patients is cured by his own suggestion since he has been administered only a dummy. The ability of the mind to heal the body could also be at cause in the miraculous spontaneous remissions of cancer that have been reported so often in the medical files but for which there is no medical explanation. The nocebo effect is the opposite effect of the placebo effect; it is the negative effect that the doctors’ diagnoses have on the cure of their patient. Therefore the doctor-patient relation is of a crucial importance in the healing process. It is a western ethical code that the patient has the right to know his medical condition in all cases, however the drawback is that when a doctor straightforwardly gives a patient the diagnosis ‘you have an incurable cancer sir’, he has actually given his patient the death sentence. The diagnosis ‘incurable’ kills the patient’s last hope for a cure and along with it his mental abilities to heal himself, besides that he will probably have a mental shock as well. Does something like a collective conscious, a consciousness shared by all humans on Earth exist? Psychologist Carl Jung speculated that we all share a common sub-conscious. But could such be proven by science? At the prestigious Princeton Anomalies Research Institute (PEAR) they are convinced that a collective consciousness does exist, in fact they are monitoring it all over the world right now while you read these words! At Princeton for some time now, Professor Robert Jahn and his colleagues have been conducting a series of laboratory experiments trying to prove or disprove the existence of psychokineses (PK for short), the ability of thought to affect inanimate objects. PK has become popular after public appearances of spoon bender Uri Geller. At Princeton they took PK very serious and wanted to test whether or not the phenomenon exists. They used RNG machines to do this. A RNG is a random noise generator, a device that generates according to the uncertainty principle of quantum mechanics a totally random noise. This noise is translated into a binary state, a 1 or 0. Now since the noise is random we expect a 50-50-chance occurrence of both ones and zeroes produced by the RNG device. Participants in the experiments conducted at the PEAR institute were asked to mentally influence the outcome of the RNG number generations. The participants were ordinary people and had no prior known psychic abilities whatsoever. However at the PEAR institute it was proven time and again, that mental abilities of ‘mind over matter’ exist since the 50-50 change RNG outcomes could be substantially altered. They conducted tests for more than a decade, tested hundreds of subjects in thousands of trials when they finally concluded that PK was real. They even concluded that PK abilities are common to everyone to some extent. Their subjects did not have any prior known paranormal abilities. At Princeton they have become so convinced that PK is real that they are now searching for a theoretical explanation. "We don't see much point in continuing the collection of yet more data," he said. "We're setting up experiments to get a better comprehension of these phenomena." If you’re interested and want to test your psychic abilities on-line on the Internet yourself at this Internet address. At some odd 30 universities all over the world RNG devices have been installed and are connected over the Internet. The next thing PEAR wanted to test with the RNG devices was whether a human collective consciousness exists. The project was called the ‘Global Consciousness Project’ and the RNG machines were used to send their results over the Internet to a central computer at Princeton. 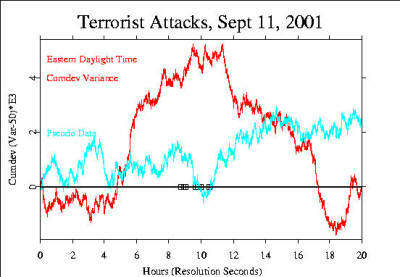 This research proved that the RNG devices could register shocking global events that moved the masses collectively. A few of these events are the funeral of Princess Diana, the verdict in the OJ Simpson case and more recently the 911 attacks in New York. All of these events showed measurable and significant deviations from the expected 50-50-chance distribution. 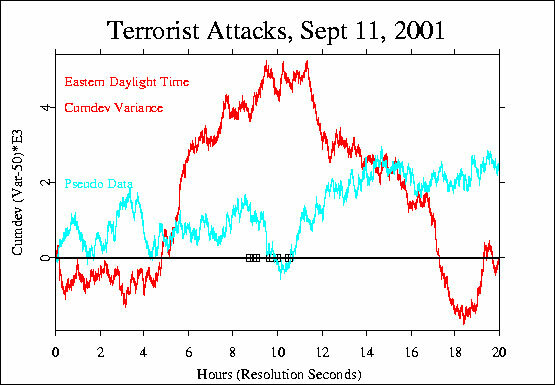 In case of the 911 attacks on the twin towers, the RNG devices even registered deviations before the actual attack! Russel Targ and Harold Puthoff in the seventies conducted a number of experiments to find out if telepathic transmission of metal images between individuals is possible. They used a sender and a receiver and put them in electro-magnetically sealed chambers. The sender was submitted to a light that flashed at regular intervals. Both the sender and the receiver were attached to devices that registered their brainwaves, their electroencephalogram (EEG). The flashing of the light was reflected in the electroencephalogram of the sender, as was expected. Next the receiver was asked to receive the images of the sender. After a while the receiver started to pick up the light flashes that were admitted to the sender. The same patterns showed up in the receiver’s EEG, although he was in a separate and electro-magnetically shielded room. Russel Targ and Harold Puthoff reproduced the earlier tests of Jacobo Grinberg-Zylberbaum of the National University of Mexico. He performed more than fifty experiments over five years. Jacobo Grinbert-Zylberbaum placed his participants in shielded Faraday cages. Prior to any tests, the participants were asked to meditate for twenty minutes. After this period they were placed in the Faraday cages and also connected to EEG measuring equipment. The sender was subjected to a series of at least a hundred stimuli ranging from intense light flashes to hard sounds and electric shocks applied to the index and ring finger. Grinberg-Zylberbaum proved that in 25 percent of the cases the stimuli admitted to the sender were transferred to the receiver and showed up in the latter’s EEG as a potential that was coherent with the potential in the sender’s EEG. Similar results could be replicated with the same participants in later experiments. When the same test was conducted with an infatuated couple, the brainwaves in the EEG of both lovers showed a remarkable coherence even when no stimuli were admitted. The couple themselves said they had a strong feeling of connectedness and oneness. These experiments proved that feelings of connectedness have a physical representation in the separate brains of separate individuals. If we can really connect to another person such that our own brainwaves show up in the other person’s brainwaves, we may start to ask questions about our own individuality, our own separate ego. These experiments seem to underpin Hameroff’s quantum brain theory of proto consciousness that is received instead of being produced by the brain. The question hence is do we have a separate ego or is it some kind of an illusion? Working for the Defense Intelligence Agency (DIA) of the U.S.A, Russel Targ and Harold Puthoff later conducted a great number of psi experiments in intelligence area that was coined ‘remote viewing’. The objective of ‘remote viewing’ is to spy on enemies. Targ and Puthoff impressed the DIA with the results they obtained with the famous psychic Ingo Swann. It is a public secret that the intelligence departments of the U.S.A and Russia have been using remote viewing techniques for some decades now however just recently seventy three thousand pages of secret documents about extrasensory spying has been declassified by the United States. The CIA now states openly that they have been using remote viewing as a means of espionage. The Japanese monkey Macaca fuscata, living on the island of Koshima off the Japanese coast had been a subject of study for at least 30 years. In 1952 researchers fed the monkeys sweet potatoes that they dropped in the sand. The potatoes were dirty and although the monkeys liked the sweetness of the potatoes, they obviously disliked the dirt. A young baby monkey found the solution and washed the potatoes in a nearby stream and handed them to her mother. Once she had taught this trick to her mother, gradually more and more monkeys mastered this trick. Between 1952 and 1958 a critical group of monkeys - estimated to be a hundred had learned the trick of washing the potatoes. Monkeys are slow learners, aren’t they? However, after the supposed hundredth monkey learned to wash his potatoes, all of a sudden the whole tribe on the island mastered this trick. Even more surprising, colonies of monkeys on other islands and on the mainland also suddenly began to wash their sweet potatoes. For some unexplained reason, the ability was transmitted to other monkeys in remote locations. Although the exact count - the critical mass - that was needed for this phenomenon to happen is uncertain, it has become famous as the ‘Hundredth Monkey Phenomenon’. Studies were conducted to see if the effect is applicable to humans and they revealed that humans also share knowledge unconsciously as if we share a common database. When certain puzzles were taught to single members of a group, the puzzles could be solved significantly more easily and quickly when the ‘hundredth monkey’ of the group had learned the trick. According to ‘cutting-edge-out-of-the-established-framework-reasoning’ biologist Rupert Sheldrake, our consciousness is connected to unseen collective fields that he calls morphic fields. Every member of a group contributes to the collective morphic field and the total awareness of this morphic field is accessible to each individual of the group. There are countless morphic fields, at least one for every species. Sheldrake also believes that morphic fields contain the information for the building plan of a living organism. Although it is commonly believed that DNA contains all the information required to build an organism, this is certainly not true. The DNA contains only the information for the construction of the materials that are required to build the organism; it does not contain the assembly plan itself! In the first stage of the embryo all cells are 100% identical and differentiation takes places after the fifth cell division (32 cells). But where does this information about what cell is to differentiate into what - what part of the embryo is to become a head cell and what a tail cell - come from? The information cannot possibly come from the DNA itself, since the cells can’t discriminate among themselves - so what is orchestrating the embryo growth? Rupert Sheldrake thinks that this information is stored in an external morphic field. It may also be the explanation of the rather strange phenomenon of gene recovery discovered in fruit flies. Biologists had removed the genes that were responsible for eyesight from the DNA of a colony. The flies all went blind. However, miraculously after a few generations, the genes were restored in the DNA and the flies could see again! It is now believed that the information of the missing genes was recovered from the morphic field of the DNA of the fruit fly. Professor of Physics at the University of Oregon, Amit Goswami, author of ‘The Self Aware Universe’, ‘Quantum creativity’, ‘Physics of the Soul’ and ‘The Visionary Window’, is the founder of a whole new brand of science called ‘science within consciousness’. Goswami believes the paradoxes imposed by quantum science can only be solved if an opposite view is adopted about consciousness. In the current worldview consciousness is regarded the side effect or the epiphenomenon of brain activity. Consciousness is simply the result of the chemical dance of molecules and electrical fields of energy in the brain. This causal deterministic view of consciousness is called upward causation and claims that our free will is illusionary. All human behavior is simply determined by our chromosomal makeup and the sum of mechanical, electrical and chemical processes that happen in the body. Following this concept, humans are just complex machines without free will. Amit Goswami however believes in a downward causation for consciousness and that consciousness is the ground of all being. Consciousness cannot be both its own cause and its own result at the same time! The chicken and egg problem is solved if consciousness is seen as primordial. Amit Goswami’s religious Hindu background taught him that the mind of Brahman is the only cause for the universe, however from his scientific skeptic background he refused to believe it. Finally he gave in and accepted that his religion had been telling the truth all along. He is trying to teach that our material realism, the belief that our material world is the only reality there is, is false and that the ground of all being is consciousness. In this article we have seen that consciousness has a far greater impact in our daily experience of the world than ever believed before. The impact of consciousness is not restricted to the quantum realm of quantum physics alone, it also plays a significant role in the world at large that we live in. The centuries old idea of a strict separation between body and mind suggested by René Descartes is false. Our thoughts and feelings are not limited to our bodily internal experiences of reality but have a measurable and provable effect on the outer world. Science can no longer claim that consciousness is solely the domain of spirituality and that there is a strict borderline that should not be crossed. It has brought quantum physicist Amit Goswami to believe that we have held the world upside down. It’s not that consciousness is an effect of the materialistic world; no it’s the very cause of it. But if this is true, if consciousness creates the physical world, what does it create it from? At least consciousness should involve some form of energy, a spiritual energy for that matter that is required to create anything at all. If the quantum brain theory is right that consciousness is everywhere in the universe and not restricted to the brain, then this energy should be found anywhere in the universe as well. Noetic Science plays a major role in the latest novel by Dan Brown called 'The Lost Symbol'. The book predicts that a major shift in consciousness will take place around the year 2012 due to this science alone. Amit Goswami, is a theoretical nuclear physicist and was a member of The University of Oregon Institute for Theoretical Physics starting in 1968, teaching physics for 32 years. After a period of distress and frustration in his private and professional life starting at the age 38, his research interests shifted to quantum cosmology, quantum measurement theory, and applications of quantum mechanics to the mind-body problem.